Keep your waterscape rocks in place and create an even water flow using the Savio Black Foam Cartridge. This cartridge is designed to be used exclusively with the Savio Black Foam Gun Applicator (not included), directing a precise line of this polymer where you need it. The product expands to create a waterproof seal, filling cracks between rocks, and bonds to most construction materials with ease. The black color meshes with your pond liner, and the closed cell formulation retains its shape and pliability. This foam is specifically made to be safe for use in features with aquatic life, and cures in 24 hours. 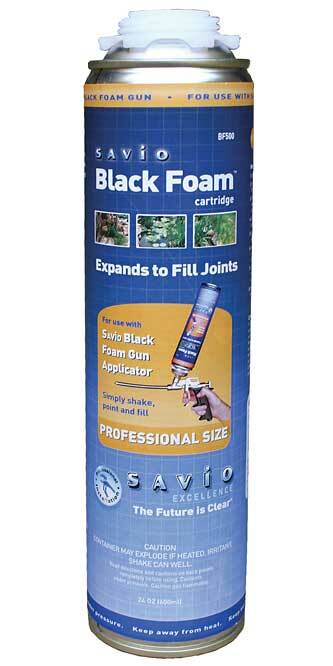 Create a lovely water flow in your backyard water garden with this Black Foam Cartridge.